White has made the mistake of pincering at , which is inconsistent with his move at 3-3. The 3-3 stone emphasises on territory only and does not have noteworthy shimari or extensions. 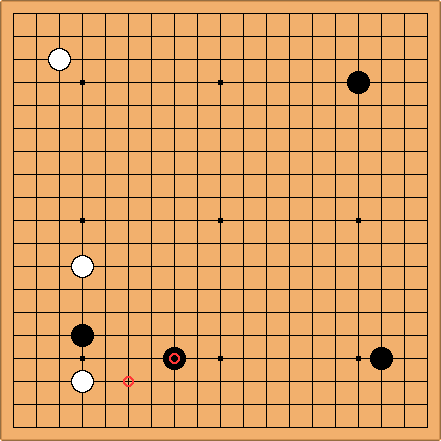 White should have played at either 'a' or 'b', which should both result in a better development for W than this pincer. The question is however, how should black take the advantage? Bill: I don't like , either, but I'm not quite ready to call it a mistake. I do not like a, either, because of the avalanche. 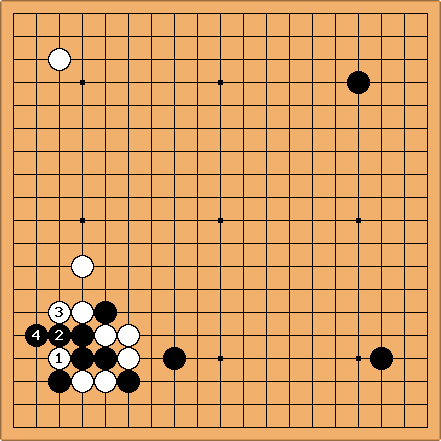 c looks OK. White's 3-3 mitigates the effect of any Black thickness, and any White thickness should support a kakari against . Floris: The three-space keima seems the most interesting here, black is showing more interest in the lower side compared to the ogeima. Just as a reference, here is the expected continuation with the ogeima. White gets a nice position on the lower side after and black will attempt to attack white on the left. But after white will jump away lightly at 'a' or 'b' and B is left with an unsettled group. 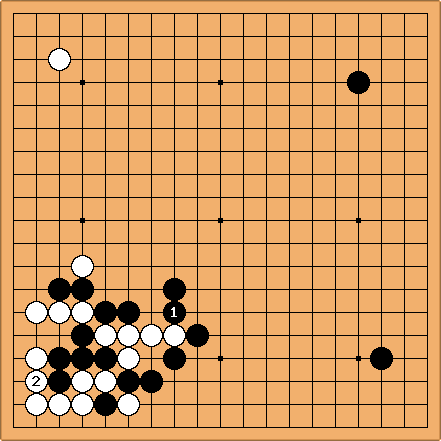 ( also possible at c, better for attacking & but on the other hand easier for black to aproach white's position at 'd'. Bill: We see this position differently. White's bottom position does not look so nice to me for the opening, and Black's group on the left does not seem to be hurting. I prefer Black. 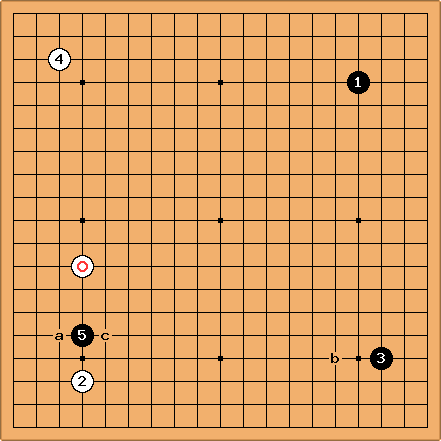 Bill: I think that White's play (Diagram 1a) is amai. How about this? With so far away, White does better to play the solid hiki at , I think. I do not know best play from this point, but looks out of place to me. I don't think any special measures are required to take advantage of White. The normal taisha or outside tsuke? responses seem OK to me. White's lack of coordination has already occurred. 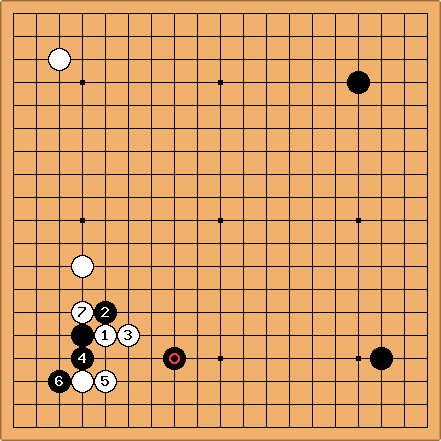 Floris: If White plays as such, the following diagram is (almost) forced. The result looks more than satisfactory for Black in my eyes. Bill: I am not so sure about or or . Floris: looks like it can also be played at . This variation focuses on the left side while the variation focuses on the lower side. looks forced to me, if he plays at instead white will play at 'a' and black will be forced into bad shape. 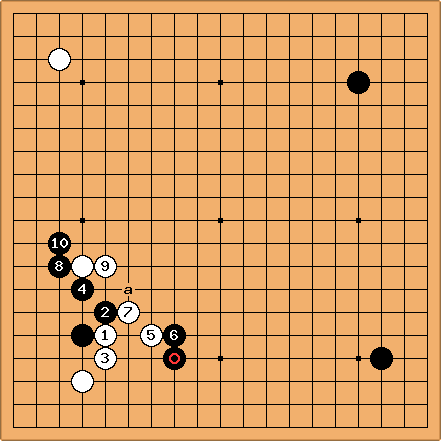 If black tenuki here, white will play and black will have an unfavorable position. I agree. seems slack. Although capturing this stone in a ladder looks quite big for Black. Bill: But earlier, I think White should stand with . Instead of , if Ba, Wb. Floris: What if Black plays as such? Bill: Well, I wouldn't call strong. Nor does Ba look all that great to me, since Black is already strong there. 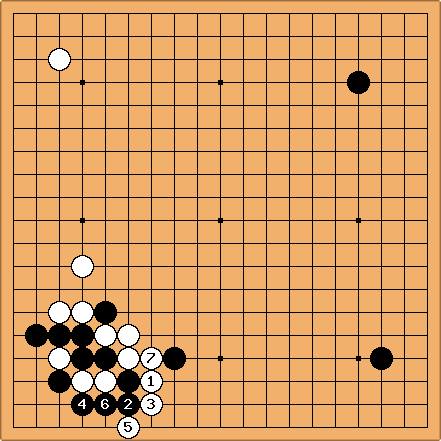 Looking back at the first diagram, I think that Black made an overplay. Namely, . White can now cut with , giving Black a lot of trouble. Floris: is a severe cut but black has a reasonable answer. Esp. with White's stone at 3-3 i prefer black in this position. 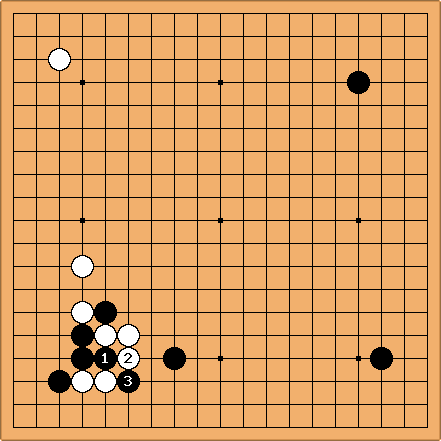 Bill: This result is so good for Black it looks like White has fallen into a trap. Bill: Maybe White should give up the corner, something like this. Floris: This counter-pincer strategy does not seem like a good idea to me. Even though black's pincering stone will be impossible to attack because of white's low and inactive position, black isn't able to attack white severely either because his 3-3 stone is very solid. This will lead to a one-sided attack that will bring black more harm than do good. 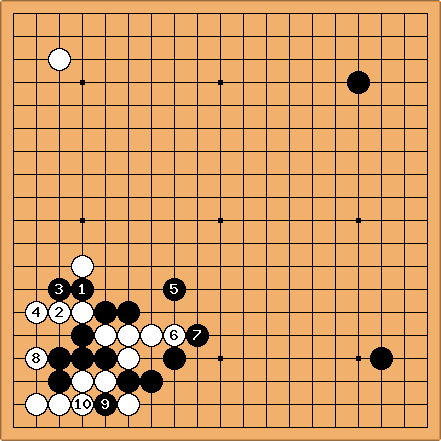 Bill: I agree that this strategy is not so good, but I think Black can do better with it. Considering the right side, surely Black wants to play at . And the exchange, - makes for a better attack. Still, Black has fallen a bit behind, I think. Bob McGuigan: From Floris's original suggestion, in the following diagram, there are some alternatives to imitating the joseki for the ogeima. 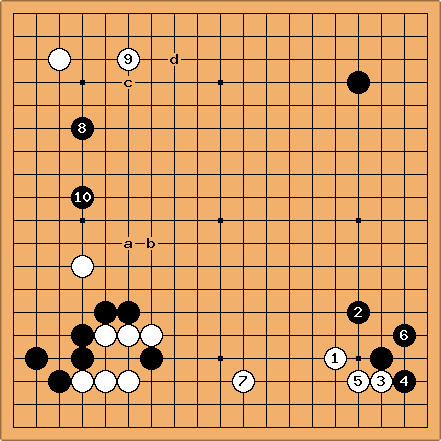 White can play tenuki since the stone doesn't put much pressure on the corner, or a White move at is also possible, which could transpose into one of Bill's variations. Floris: This is a good point. 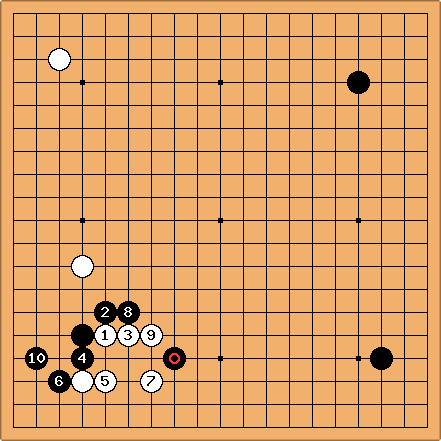 A search on GoGoD reveals about 5 games in which this joseki is played and is a move among them. John F. I normally don't give these position discussions more than a passing glance, but this one caught my eye because of - in order - the title (should be changed, I thought), a comment by Bill that struck a chord, and assessments of the position I didn't agree with, despite largely agreeing with the reasoning that went into to them. But what really staggered me was discovering how remote all this was from professional play. First, the title. 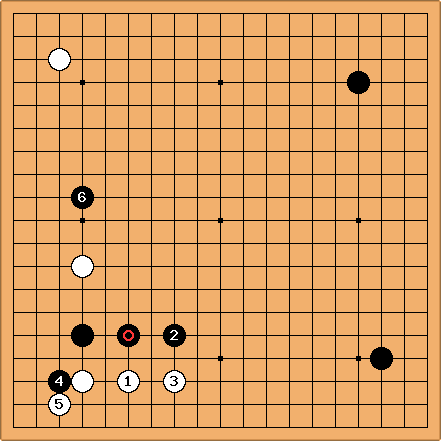 One of the major realisations of my go life is realising that mistakes in go, especially the fuseki, often (most often?) don't need to be punished. They've already punished themselves. That was the gist of Bill's comment I liked. I have to say that, despite knowing this, I find it hard to live up to. As soon as I see what I think is a mistake by an opponent, I tend to act like Princess Anne's dogs. I end up cancelling out the opponent's mistakes with mistakes of my own. As a thought en passant, is that because many of us first learnt to play chess? There you generally have to punish a mistake instantly. Rather more fancifully, is this a feature of the famous Ruth Benedict paradigm: we have a guilt culture; the Japanese have a shame culture. 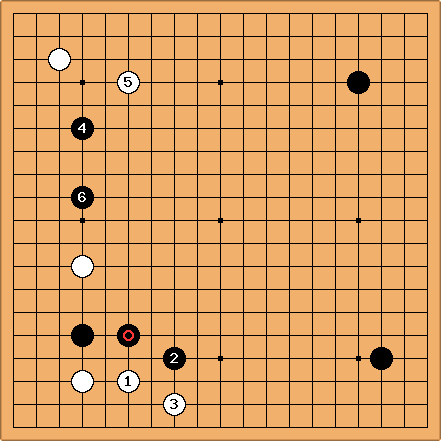 If the opponent makes a mistake, a Japanese (on this fanciful reading) would be inclined to leave it for the world to see and leave him in shame. We tend to think he's committed a sin so he must be punished. However, perhaps the most interesting aspect is what a database threw up. The fuseki up to Black 5 is rare. Only three examples in 27,000 games. In none of these games did White pincer. So if a mistake has occurred, the inference seems to be that it has occurred already. 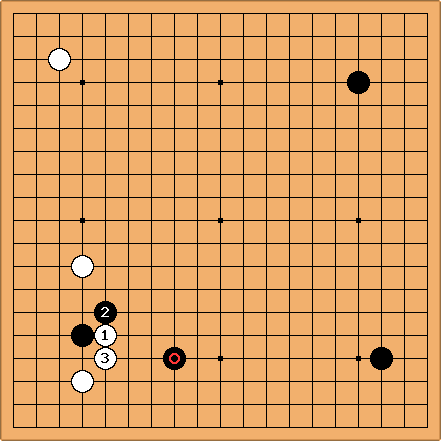 Actually Black 5 itself is rare - the favoured move is a shimari in the lower right. But take only the position on the left side. This appears to have occurred in only 297 games. White often tenukis. But if he does play here, the attachment underneath is overwhelmingly favoured (184 cases). The pincers occur as follows: dogleg 11, magic dirk 5, magic sword 17. It seems, therefore, that a pincer and san-san don't normally go together. It doesn't seem to be a case of the komoku being in the wrong place. There were 796 cases of this orientation, and 398 with the other (side-on). So, in summary. 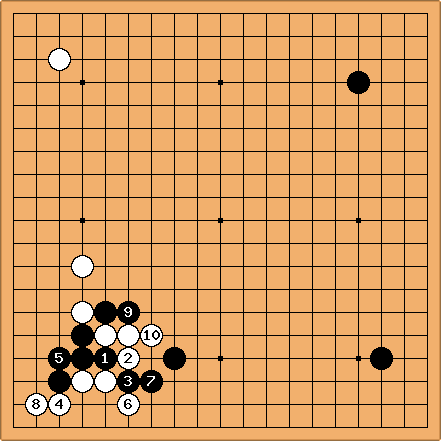 White's first two plays are fine, but imply a strategy that does not involve a pincer. Here, therefore, he may have erred and so Black is possibly ahead already, and very unlikely to be behind (which brings me back to my feeling that I didn't agree with the positional assessments). Floris: This seems like a good way to look at it. Then the title of the problem should be "DirectionOfPlayProblem1?" instead.